Photo shown online is a representation only. Specific container, wine label and fruit choices may not be included due to local availability and designer's preference. The California Classic is a hand delivered gift. These gifts are delivered by one of our local design centers located throughout the United States and Canada. Same day delivery is available for most gifts when ordered before the cutoff time. The cutoff time for The California Classic is 1 PM in the recipient's time zone. I use GiftTree for my clients after they close on a property. The range of gifts and the timely delivery make GiftTree a no brainer. My clients enjoy the gifts! Highly recommended. Sent to my sisters for their night out. They loved it!! The Gift was delivered in good time. My brother posted a picture of him and his grand daughter with the gift in FaceBook! I am very pleased with your service and will certainly use you again as I have two Brothers and a sister with their families in the USA and Canada. The family of 6 devoured the contents the first day! I ordered this for a birthday gift. He was happy with it and I can't thank you enough for getting the arrangement to him on time. I will definitely use your services again. Thanks so much! The recipients of the gift were very complimentary of the fruit and wine. It was delivered in a timely manner. Very pleased. The recipient of this gift basket expressed how beautiful it was, the fruit was fresh and the wine was exquisite. I would recommend this to anyone who is looking to send a gift or purchase it for themselves...great product.. 2 thumbs up .. 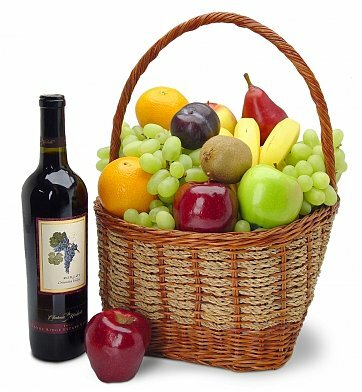 The California Classic fruit and wine basket is a great gift for the price.